Observation - Great ramshorn snail - UK and Ireland. Description: This dead shell was lying in a heap of dead vegetation that looked like it had been dredged from the adjacent ditch. It immediately caught my eye because of its size, flat shape and the enormous aperture. 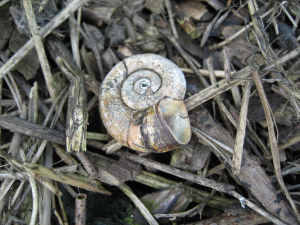 This dead shell was lying in a heap of dead vegetation that looked like it had been dredged from the adjacent ditch. It immediately caught my eye because of its size, flat shape and the enormous aperture.